PM Netanyahu says the Jewish People will always remember Trump as he who recognized Jerusalem as Israel's capital. 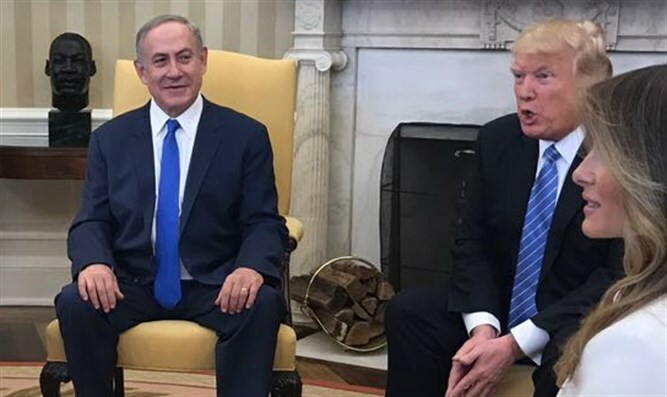 Israeli Prime Minister Binyamin Netanyahu and his wife Sara on Monday met US President Donald Trump and his wife Melania at the White House. In a statement following Trump's remarks, Netanyahu said, "Thank you. Mr. President, Donald, Melania. Sara and I want to thank you for your extraordinary friendship and hospitality. It’s always a pleasure to see you both." "This is the first time we meet in Washington, America’s capital, after you declared, Mr. President, Jerusalem as Israel’s capital. And this was a historic proclamation, followed by your bold decision to move the embassy by our upcoming national Independence Day. "I want to tell you that the Jewish people have a long memory, so we remember the proclamation of the great king, Cyrus the Great, a Persian king 2,500 years ago. He proclaimed that the Jewish exiles in Babylon could come back and rebuild our Temple in Jerusalem. "We remember a hundred years ago, Lord Balfour, who issued the Balfour Proclamation that recognized the rights of the Jewish people in our ancestral homeland. "We remember that 70 years ago, President Harry S. Truman was the first leader to recognize the Jewish state. "And we remember how a few weeks ago, President Donald J. Trump recognized Jerusalem as Israel’s capital. Mr. President, this will be remembered by our people through the ages. And as you just said, others talked about it; you did it. So, I want to thank you on behalf of the people of Israel, and on my own behalf. "I look forward to our discussions on both the challenges and opportunities we face." Netanyahu then spoke about the threat Iran presents to both Israel and the US. "If I had to say what is our greatest challenge in the Middle East to both our countries, to our Arab neighbors, it’s encapsulated in one word: Iran," Netanyahu emphasized. "Iran has not given up its nuclear ambitions. It came out of this nuclear deal emboldened, enriched. It’s practicing aggression everywhere, including on our own borders." "I think we have to stop this country that chants, 'Death to Israel, death to America.' Iran must be stopped. That is our common challenge."